One of my favorite types of dinners are big salads. Salads that are the meal not an accompaniment to the meal. One of the best parts of middle school (there weren’t many) was that middle schoolers got to have the option of eating from the chef salad bar on Tuesdays and Thursdays. For three years I ate a salad pretty much every Tuesday and Thursday. It was awesome. The lunch ladies offered so many tasty topping options ham or turkey cubes, hard boiled eggs, baby carrots, broccoli florets, chopped tomatoes, home(school)made croutons, cubes of cheddar, and sunflower seeds pretty much made up my Tuesday and Thursday lunches. There were also several dressing options and I rotated between Ranch, thousand island, and green goddess. You also got a stack of 5-6 Townhouse crackers to eat with your salad which was fantastic. Chef salads are the only reason I would go back to middle school and where my love of salads as the meal first began. This salad was made on a night that we had both ballet and soccer after school so much running around happens on those nights, we usually aren’t all home until nearly after 7 pm . I needed to make something FAST and EASY since everyone was hungry and I was tired. Panzanella is a bread and tomato salad so I took inspiration from the half loaf of stale French bread and pint of grape tomatoes sitting on my counter. I quickly whacked that loaf into large pieces, tossed it with some oil and seasonings, and baked them until toasty. The croutons where busy getting their crunch on while I pulled out my grill pan and cooked a couple chicken breasts. The chicken helped this salad have some staying power. My two year old has been known to wake up in the middle of the night declaring he is hungry. Â I was able to prepare and cook this dinner in about 20 minutes and everyone went to bed on time. This is a major success on our busy nights. 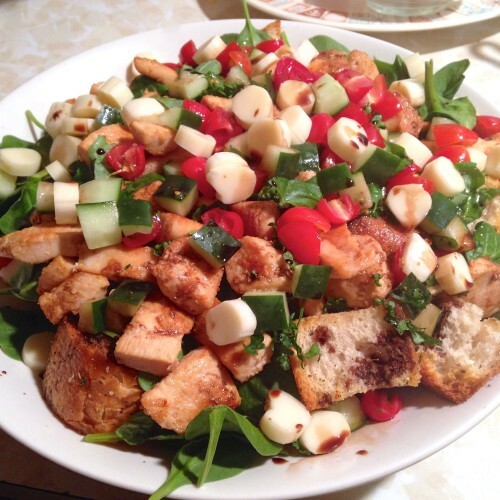 The large croutons and chicken breasts got laid on some baby spinach leaves that needed to be used up and topped with cucumbers, grape tomatoes, and sliced string cheese (I would have used fresh mozzarella had I had any). I plucked some basil leaves and parsley from my Aero garden, chopped them up and added them to the salad. Mainly to be fancy. Everything got a drizzle of olive oil and balsamic before setting this giant salad bowl on the table for my family. This was definitely a dinner inspired by speed, what was on hand, and what needed to be used up. Â I am absolutely certain variations on this salad will make frequent appearances at our dinner table this Spring and Summer. What are the go-to quick dinners you prepare when crunched for time?Â I have been known to serve popcorn for dinner a time or ten and I have also passed off cheese, crackers, and grapes on a platter as a “fancy” dinner. We all have our moments. In a large bowl toss together bread, seasonings, and drizzle with olive oil. Pour seasoned bread on to baking sheet in a single layer. Bake about 7-10 minutes turning once. You want them nice a toasty. Remove from oven and allow to cool. Pat the chicken breasts dry. Season with 1/2 teaspoon garlic salt each. Heat a grill pan over medium high heat. Grill chicken breasts for 4-5 minutes per side. Making sure chicken is no longer pink in the middle. Remove from grill pan and allow to sit for 5 minutes before slicing. In a large bowl or in individual bowls place spinach. 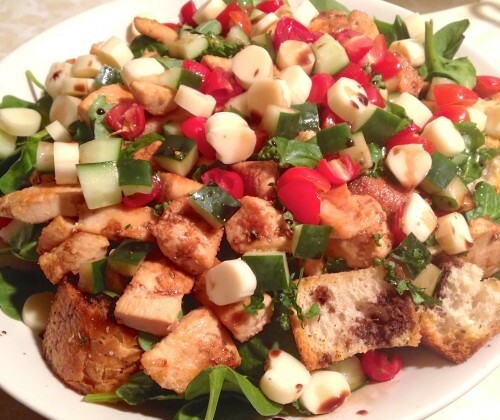 Top with croutons, chicken, tomatoes, cucumbers, cheese, and herbs. Drizzle a little olive oil and vinegar over everything. Serve. Gorgeous gorgeous gorgeous salad!!! I love the bright colors. Thanks Zainab! Salads for dinner are a major winner! I hope you give it a try soon Leslie! Plus I think homemade croutons are the best. I love that you used string cheese in this… what a great idea for a time saver!! I have to agree, salads are one of my favourite dinners! Love panzanella!